The SodaStream system makes water exciting! Turn tap water into sparkling water with the press of a button so you can create refreshing flavored sparkling water. SodaStream has easy-to-use Sparkling Water Makers to suit every countertop, and each Sparkling Water Maker comes with everything you need to start fizzing. Each Sparkling Water Maker comes with either a plastic BPA-free reusable carbonating bottle or a glass reusable carbonating bottle. 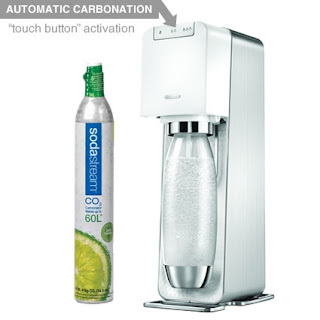 Every Sparkling Water Maker also comes with a CO2 Carbonator, which creates the fizz. Once your sparkling water is made, you can make it even more exciting with one of our 70 Sparkling Drink Mixes. When you’re out of gas, the empty carbonator can be exchanged at participating retailers for a special gas-only price. Find out where to exchange your carbonator here! Designed by Yves Béhar, the Power is an Automatic Sparkling Water Maker that offers a more convenient solution for carbonating water with touch button activation as well as quick snap-lock bottle insertion. The sophisticated and sleek design with metal accent fits nicely into any home décor. The Power requires electricity and must be plugged in. Click HERE to check out available flavors that go with the SodaStream! Click HERE to find a store near you that sells SodaStream! Click HERE to learn more about SodaStream! Follow SodaStream on social media!